Choose an eco corner desktop in the color that works with your office decor, then choose a frame color and accessories to match! Task at a seamless desktop in your choice of extension. We advise choosing the same side as your dominant hand. The 72" wide x 28" deep x 47" wide x 26" deep desktop comes with a cut-out ergo edge on the inside corner and is available in three styles. Eco desktops are made of 100% recycled MDF, have a solid powder-coated finish, and come in black or white. 1" Thick Bamboo is constructed from sturdy Moso bamboo reeds, finished with a wear-resistant UV coating, and naturally colored without using chemical stains or dyes. And Rubberwood is a 100% solid wood that's sustainably harvested at the end of its life, and makes for a natural, more rustic feel. The longer edge of the desktop measures 72" x 28". The extension is 47" x 26" and can be on the right or left side. The desktop is one solid piece with no seams. The midday slump. For some it can hit before lunch, for others, it's after. Give yourself the freedom to move at work and beat office fatigue with the UPLIFT Eco Corner Sit-Stand Desk with L-Shaped Top. It's the large, sturdy 3-leg desk of your dreams to get you working in a better position - upright. Revel in a full 25.6" (650mm) of height adjustments; a quiet, electric motor in each leg does the work of bringing your sit-to-stand 3-leg desk to your preferred sitting and standing heights for more energizing work when you need it. A three-stage frame allows the desk to adjust for height a whole 33% faster than two-stage frames, saving you time. Breathe easier knowing that you're welcoming a desk into your work environment that's powder-coated and manufactured with zero toxic solvents or pollutants. The 100% recycled MDF Eco desktop is created from recycled wood material for low environmental impact, the 1" Thick Bamboo is grown without pesticides and colored and finished without the use of any chemical stains or dyes, and our Natural Rubberwood is sustainably harvested near the end of the tree's life. No matter your style, know that you are making a responsible choice. The center cut-out improves comfort and allows you to get even closer to your Neutral Reach Zone, while smooth corners and softly-beveled edges round out the ergo-friendly design. The adjustable height desk is also scratch- and abrasion-resistant and comes in black or white for a stylish corner adjustable height desk that fits seamlessly with your unique office vibes. Corner walls often translate into inefficiently-used space. A corner desk lets you reclaim that corner space while adding extra desktop real estate. The UPLIFT Eco Corner Sit-Stand Desk with L-Shaped Top is able to elevate your work to the best working levels for you, lifting up to a heavy 530 pounds of desktop gear easily and offering optimal stability with the third leg. Monitors, keyboards, and mouse platforms will have a new ergonomic home base where it's more beneficial for you; outfit your standing corner desk with accessories to give your workstation a complete upgrade for more comfortable and healthy work from the first stand. I have the advanced keypad. When I touch one of the presets my desk only moves a fraction of an inch, does that mean something is wrong with my keypad? Your memory presets are working, odds are that you have an older control box. To recall your preset heights, you have to press-and-hold the memory setting until your desk reaches standing height. This is for safety, since the older UPLIFT 3-Leg Frame did not have the ability to sense an obstruction and stop. If you see the number 99.046.14.0070 printed on the sticker located near the power socket, then your control box is capable of one-touch memory preset function and may need to be reset - see our Programming Your UPLIFT Desk PDF for instructions on locking the keypad, changing the memory presets from one-touch to press-and-hold, and setting new lower or upper height limits. You bet! You can check to see which version of control box you have by glancing at the silver label on it. If that sticker says v4.1, you have the newest version of UPLIFT Desk's control box, which means you have a few new features to enjoy on your desk. The latest version of UPLIFT Desk's control boxes comes with several exciting new safety features like Collision Sensitivity, Keypad Lockout, and the new ability to toggle between One-Touch and Constant-Touch modes with a few buttons. You can read about how to access these awesome new features on our blog post about the subject! If I live outside of the United States, will this desk work for me with my outlets and voltage? In most cases, yes. All UPLIFT Desks are designed to run on the US electricity standard of 120 volt. If you're ordering an UPLIFT Desk from outside the United States, minus Canada, you'll need to plug your desk into a step down transformer before you plug into the wall, otherwise you run the risk of overloading your desk's control box, which is not covered by warranty. Contact us if you have additional questions. Does this top come in two pieces like your other L-shaped corner desks? No, this is one continuous, powder-coated piece like our rectangular Eco tops. Can I customize the size of my L-shaped Eco Desktop? We stock all of the Eco desktops in our warehouse. Therefore, custom sizes are not available for order. This is how we help to keep the cost economical on a corner desktop. This is sent via freight due to its size and will be shipped from our warehouse within 1-2 business days. Does the Eco corner desktop come in any other colors? The Eco corner desktop is available in black and white, and we have now added 1" Thick Bamboo and Natural Rubberwood option in the same size and dimensions. Is this the same top as the standard Eco desk? The Eco black and white options are the same material and finish. The 1" Thick Bamboo and Natural Rubberwood desktops are different woods option that match the desktops on the UPLIFT Stand Up Desk with 1" Thick Bamboo Top and UPLIFT Rubberwood Solid Wood Sit Stand Desk listings, respectively. What kind of cleaner can I use on my desk? The Eco Desktop is sensitive to chemicals so we recommend using warm, soapy water to wipe up anything on your desktop. Could I put two of these side by side? Yes, just order one desk with a right extension and the other with a left extension! Oh, and please send us a picture of your awesome desk setup! Can I put four legs on this desk for added strength and security? You can put four legs on this desk but the UPLIFT Desk 3-leg frame is extremely stable. The 3-leg frame will offer more than enough support with a carrying capacity of up to 530 lbs. You would also have to make sure that the weight of the desktop is evenly spaced between all four legs, which might not be as easy to do with the corner desktop. Okay so what is the deal with three-stage frames? UPLIFT Desk frames are three-stage vs the less versatile two-stage desk frames their competitors use, which means these desks are 33% faster thanks to using 3 spindles instead of 2. This means you have a higher adjustability range so desks fit shorter users and kids, all the way up to tall users or those who plan on adding a treadmill to their setups later on down the road. How many motors are in the base? All UPLIFT Desks come with a motor in each leg, so in this case, three motors. This makes UPLIFT 3-leg desks quieter, safer, stronger, and more reliable than desks that work with a single motor. How noisy is this desk? Your UPLIFT Desk will emit 45 decibels during motion, which falls between the noise put off by your refrigerator or computer. We don't think your office mates will mind that kind of noise when you raise or lower your desk. Are there any other leg configurations for the Eco Corner Desk? We have found that the leg configuration shown is the best configuration for this shape. Placing the third, support leg on the extension side of the desk provides you with the most efficient use of space below your desk. If you were to move the C-frame leg to the extension side, you may find that the leg gets in the way of your chair and makes less of the desktop space usable. Can I get a sample of the Eco desktop finish? No, we do not offer a sample of the Eco desktop finish. Just picture a smooth surface that is similar to laminate but not as shiny. How does the Eco finish compare to a standard laminate finish? The Eco Desktop is made with a 100% recycled wood MDF core that is powder-coated for a seamless finish all over. A laminate desktop is composed of many layers that have been pressed together under high pressure. Laminate will have a band that runs along the edge, so it won't have the seamless finish of the Eco desktop. Are there guide holes pre-drilled into the desktop for assembly? Yes, your Eco Corner Desktop will come with guide holes pre-drilled for the frame. If you want to install any accessories you will have to drill the holes yourself. How thick is the desktop? The Eco desktop is 0.75" thick. How much power does this desk use? What is the purpose of the curved cut-out? The Ergo curve cutout brings you closer to everything on your desktop. 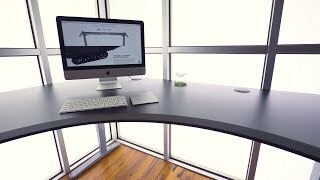 Instead of a standard l-shaped corner desk, the curved Eco desk helps you make better use of all of the space on your desktop. If planning to upgrade strongly urge you to look into this product, I have reduced the clutter, made my work space more open and inviting of dialog. Needed a third desk and went back to Uplift for a great solution, along with the use of the converter at one of my clients site. This lady was great help. sami@thehumansolution.com when I encountered some minor issues, she made sure it was taken care and even followed up. I have been using this desk for over a week now and I absolutely love it and you can't beat the price! I thought the assembly would be difficult but it wasn't. They provide great instructions and the desk was together in no time. The only complaint I have is that the top is slightly textured and a little hard to keep clean but in the grand scheme of things, it doesn't change the fact that this is an amazing desk. I had a little difficulty installing an accessory. I called and reached someone immediately, no crazy prompts taking a million years to reach a person. The representative was extremely nice, knowledgeable and was able to help me quickly. I will definitely be recommending this desk for anyone looking for a sit/stand desk. I have had this desk for about 3 months now. Assembly was pretty easy and fast, but you definitely need two people. I use it with an iMac, a laptop, a large monitor on a arm and two key boards. There is plenty of room for this set up. It is very easy to switch back and forth between the two systems and the electric height adjustment works flawlessly. Great customer service, I received the desk with a damaged drawer and the company sent a free replacement out very quickly. I am extremely satisfied with this desk and highly recommend it. Pros: The desk surface, mine is black, is very easy to clean and the beveled front edge is nice on the forearm. the circular drawer works quite well. Cons: The small sticky cable holders do not stick very well. I have tried sticking them to the bottom of the desk as well as to the metal components.Most of them have fallen off already. $999.00 List Price: $1,299.00* The list price is the same as the MSRP (Manufacturer's Suggested Retail Price). It may not necessarily be the price at which the product is sold.